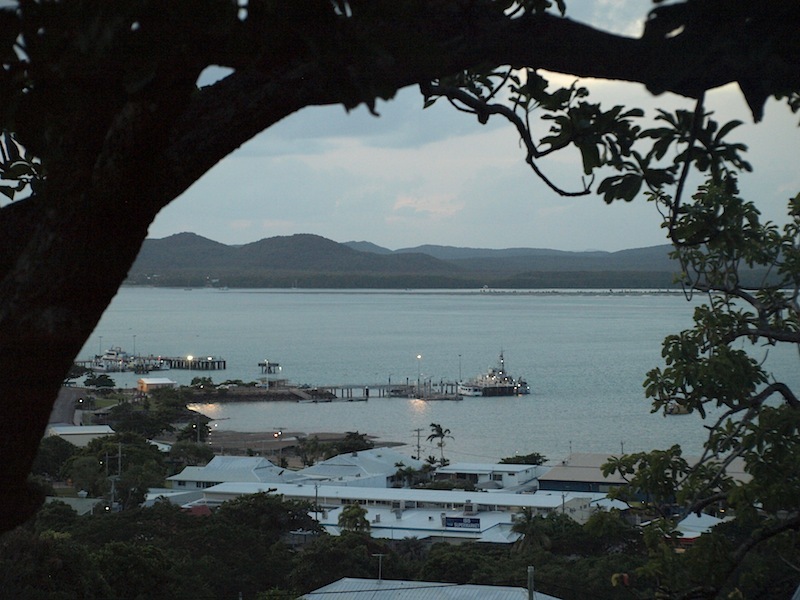 ← A New Encounter—the Torres Strait, Queensland. 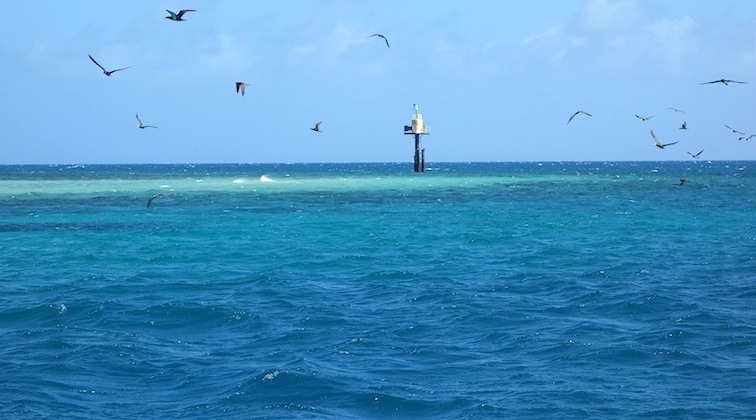 OUR JOURNEY TO THURSDAY ISLAND IN THE TORRES STRAIT VIA MACKAY, QUEENSLAND. This post relates to family. Further posts will detail the history of the Torres Strait and our experiences in this very interesting and picturesque part of Australia. The distance from Tamworth to Thursday Island (Torres Strait) is a little less than 3000 kilometres. We decided to drive from Tamworth to Mackay (about 1000km), leave our car there then catch a train to Cairns, fly to Horn Island then catch a ferry to Thursday Island. 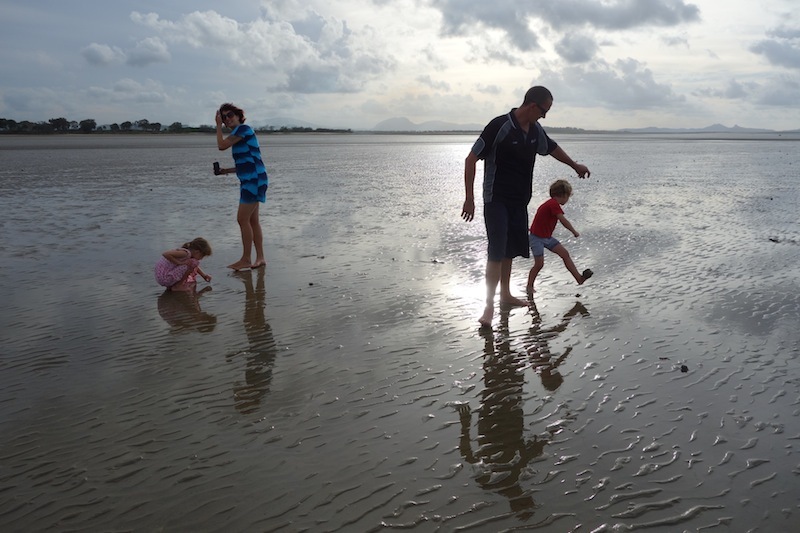 The stop in Mackay was to visit our youngest son Toby, his partner Kate and their two children Bella and Hamish. On the way to Mackay we did some bike riding and it was exhilarating to feel the freedom only bike riding can give. Toby,Kate and the kids playing near where they live. Toby, Kate and the kids are on a working holiday at the moment. Their usual place of residence is near Coffs Harbour on the mid north coast of NSW. Toby is a carpenter and Kate a teacher. Toby has not always been involved in the building trade. He started out as a press photographer and later became an adventure documentary film-maker. At some time in the future I will relate some of his adventures as a film-maker. One of his most notable efforts was to film an attempt to climb the Ulugh Muztagh, a mountain on the Tibetan Chinese border. Bev and I travelled to China and even though we didn’t actually participate in the climb we were close by and able to share in the experience. 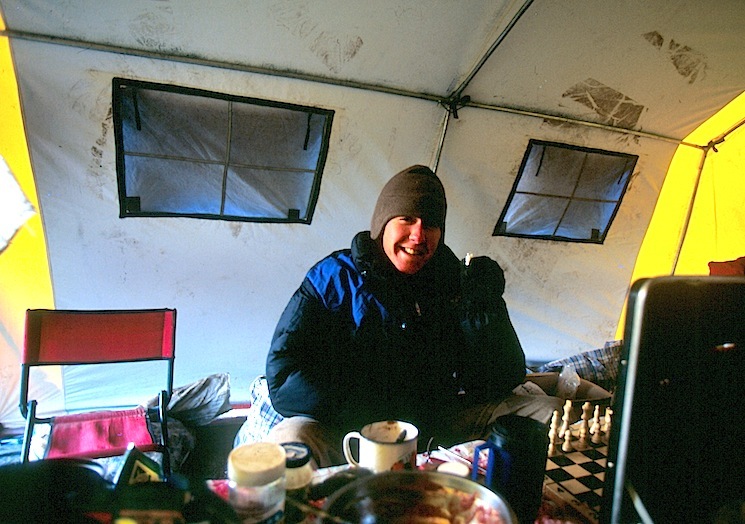 Toby in the kitchen tent on the Ulugh Muztagh expedition. 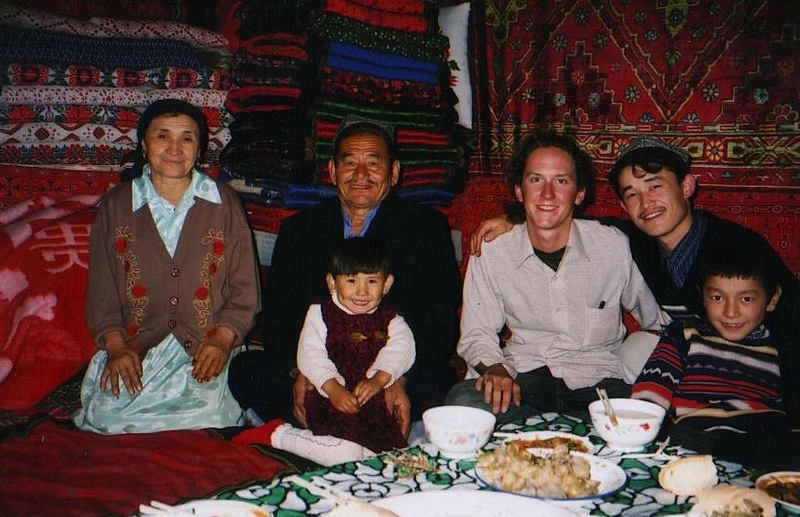 Toby sharing a meal with a Uighur family near Urumqi in western China after the Ulugh Muztagh expedition. The food was so spicy that it burnt the inside of my mouth. 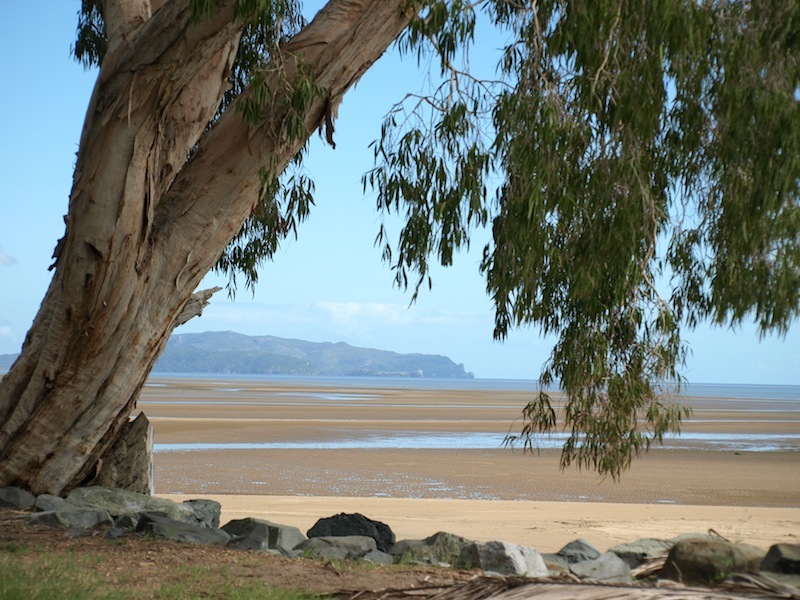 Low tide Shoal Point near Mackay. The drive from Tamworth to Mackay was without event. Unfortunately we were unable to free camp because the previous summer had been a wet one and as a result the grass was chest high. There were simply no bare spots to set up a bivvy. It is 730 kilometres from Mackay to Cairns and there is no better way to travel the course than by train. It’s much better snoozing and swanning and not having to drive. We chose to go by train because we were hankering after a trip by train after all our train travel during our recent odyssey through Europe. Also, we were wondering how Australian trains compared to their European counterparts. The Tilt train was in some ways superior to European trains so we were pleased with our choice. For us the experience was positive: power point access right at one’s seat (some European trains do not have this), up-to-date film entertainment as in aeroplanes and although we travelled at less than the train’s capable speed we enjoyed the trip, good tucker and polite staff. I assume the train is called a tilt train because of its tendency to lean on the corners, a product of the narrow gauge track. I think the train must have hydraulic stabilisers to stop the carriages leaning sideways on corners. There are three possible ways of getting to Thursday Island from Cairns. The most adventurous would be to take a 4WD up the Cape York Peninsula to the town of Seisia and catch a ferry to Thursday Island. 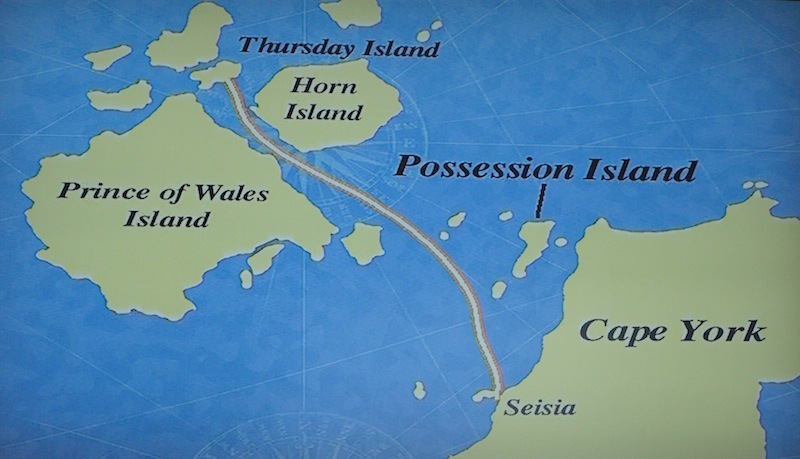 Seisia is about fifty kilometres south of ‘The Tip’, the northern most point of the Australian continent. 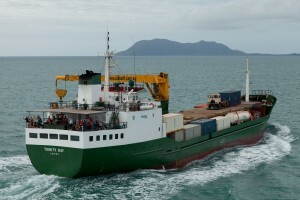 An alternative is to take the MV Trinity Bay coastal trader from Cairns, which takes around three days. The quickest, and least expensive (the option we chose) is to fly from Cairns to Horn Island and then take a 20 minute ferry ride to Thursday Island. Seisia to Thursday Island ferry route. 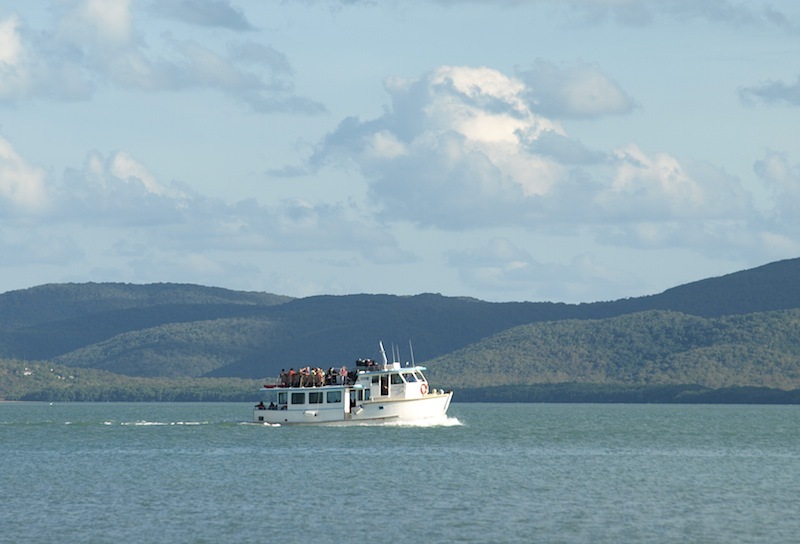 ‘Australia Fair’, the ferry from Horn Island to Thursday Island. Prince of Wales Island in the background. Engineers Wharf, Thursday Island where large boats and the ferries berth. As I mentioned previously, every year for the past six years we have had extended stays in the tropics with our eldest son Tim, Sara and their two sons Xavier and Jarrah. This is our first stay on Thursday Island and soon after we arrived we realised that Torres Strait had a lot of history, tradition and culture to investigate. Before I go into the stories relating to Torres Strait I think I should give you a brief background leading up to how Tim secured the job on Thursday Island and what he does here in this paradise. Tim completed Year 12 in 1992 and as is often the case with many young people he was unsure of what career path to take. He began by installing garden irrigation schemes in Sydney but not satisfied with the money he moved into the printing world and completed a printing apprenticeship. Soon after completing his apprenticeship he decided he wanted to go bush and ended up as a guide on the Overland Track from Cradle Mountain to Lake St Clair in Tasmania. 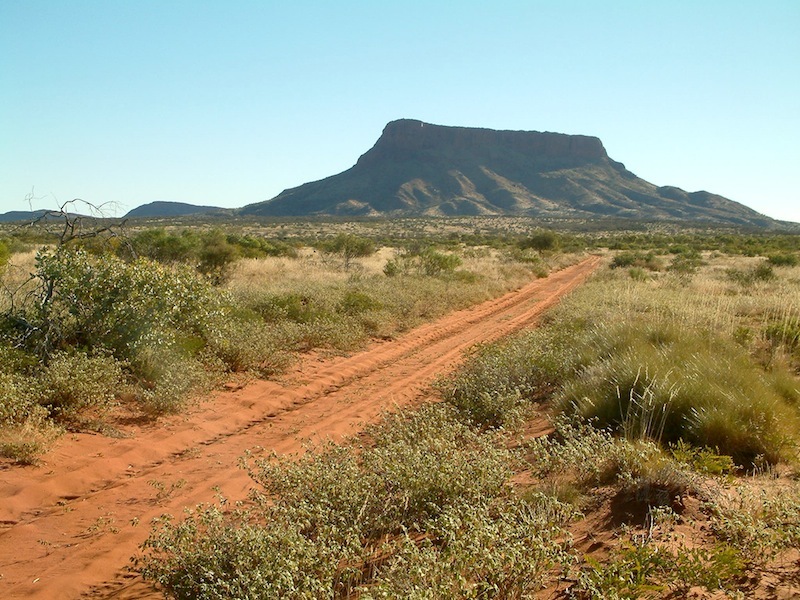 Eventually the outback called and he ended up in Alice Springs. From Alice he went to the Aboriginal community of Yuendumu (300 kilometres west of Alice Springs) and worked as a carpenter. When the temperature climbed into the mid 40s he rang and said, ‘I’m coming home to start a teaching degree’. Eighteen months later he completed his degree and migrated back to the Alice Springs area and taught at Mutitjulu College (near Uluru) and Nyrripi (500 kilometres west of Alice Springs). Tim has two loves (other than his wife and children) and they are the desert and fishing. A teaching position at Numbulwar, an Aboriginal community on the east coast of Arnhem Land came up and he moved there. 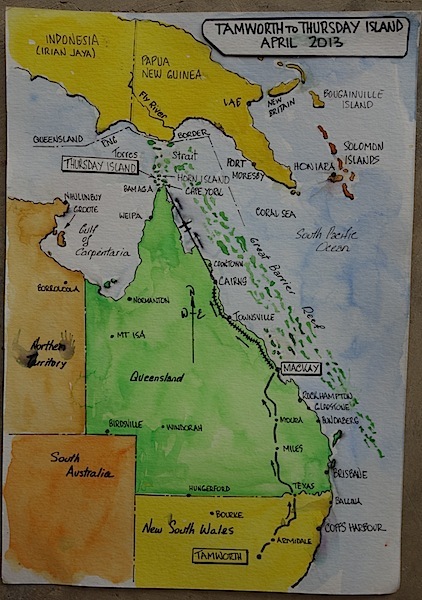 From Numbulwar it was across to Groote Eylandt for four years before moving on to Thursday Island. Country near Nyrripi where Tim taught. 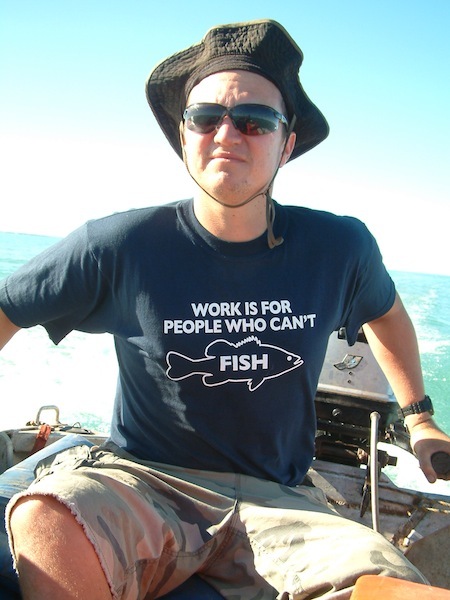 Tim’s present job on Thursday Island is Head of Curriculum Land and Sea, which involves training junior rangers and senior students in matters relating to land and sea including the monitoring of seagrass, dugong and turtle populations and the establishment of community gardens. I have suggested to him he has the best job in the world by being able to visit the islands of Torres Strait. Tim getting to know the fauna near Numbulwar East Arnhem Land. 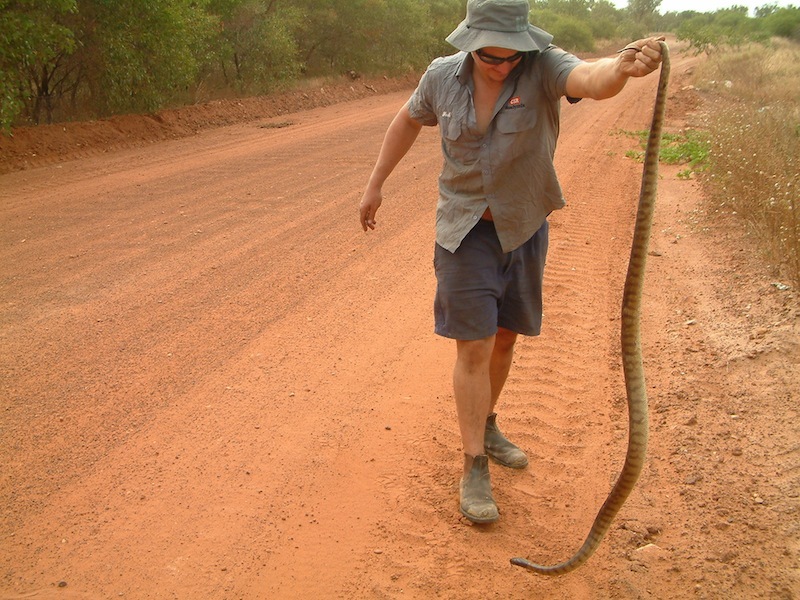 The reason for this encounter was to move the snake off the road away from danger. The next posting will be Part 1 of our Torres Strait Encounter. I hope you stay with us as we experience a part of Australia few have the opportunity to visit.